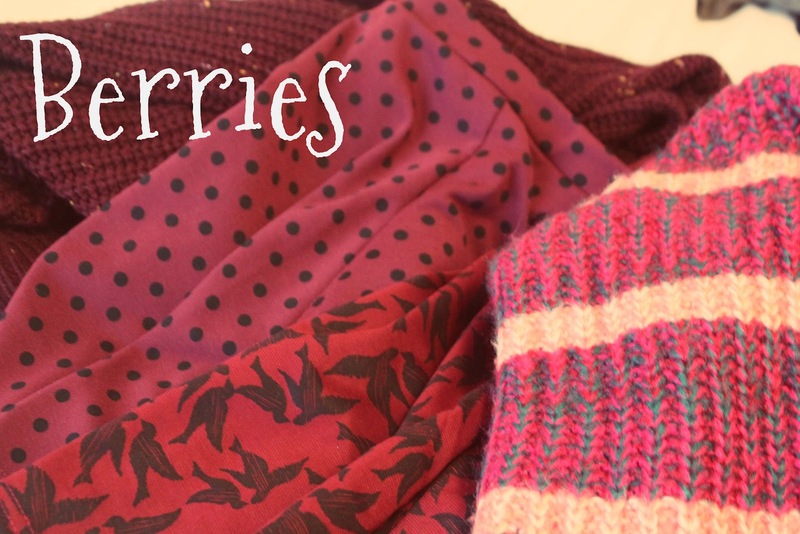 Those lovely folks over at VoucherCodes challenged me to create three outfits for the Autumn/Winter season, to represent the berries trend. Rich reds, burgundys and oxbloods have been jumping out at me every time I've been into the high street shops, so I was pretty pleased to be given this trend. 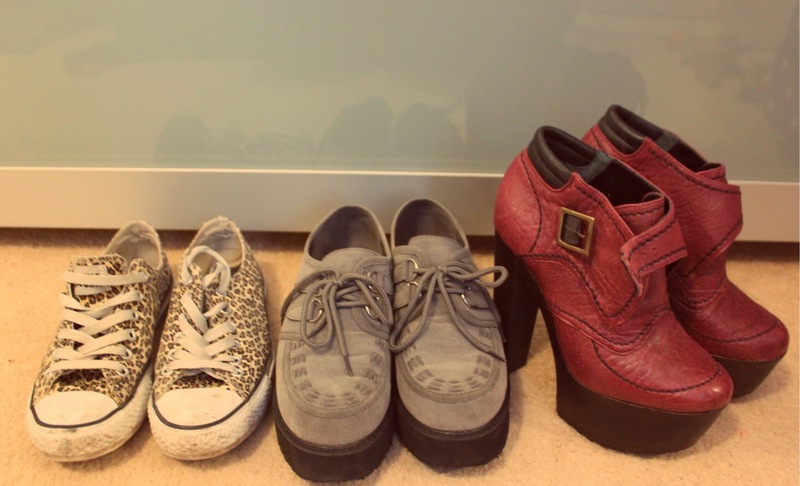 I was given an £80 budget to buy shoes, clothes, jewellery or accessories. As I have more than enough shoes (two wardrobes full plus 4 plastic bags, OOPS), jewellery and other bits and bobs I went straight for the clothes. I think I managed to get quite a lot for my money! I bought the skirt and cardigan in Outfit 1, the jumper in Outfit 2 and the dress in Outfit 3. I'd most probably wear this for a night out on the town. The shoes, while ridiculously high, are so comfortable and I can dance for hours in them. 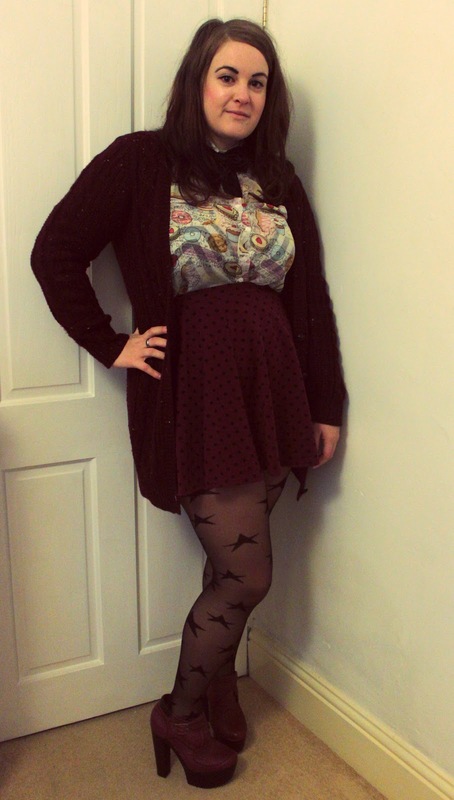 This cardigan was possibly my best bargain buy. It's cosy, a lovely colour and has gorgeous flecks of yellow and blue running through it. As I don't like taking a coat with me when I head off for a night out, this will be perfect for providing some much needed warmth this season. The polka dot skirt from River Island is pretty much my dream skirt. Patterned, soft and very forgiving on the ol' tummy. This outfit is perfect for a lazy weekend of slobbing. The jumper (which, fyi, is AMAZING) brings this floral dress into autumn nicely, bringing out the reds and pink tones in it. 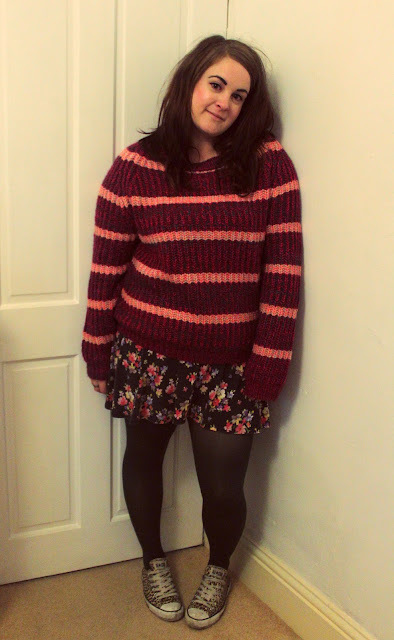 I will be wearing this jumper pretty much constantly for the next few months. I opted to buy this dress as I thought it would be perfect for work. 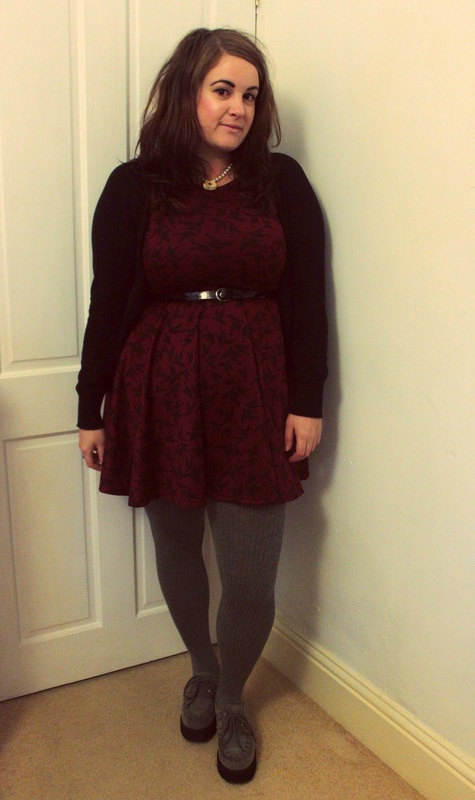 It's a gorgeous rich deep red and, paired with these grey tights and my beloved creepers, I think it's a perfect Autumn/Winter outfit. Are you embracing the rich Autumnal colours that are all over the shops at the moment, or are you clinging onto your pastels and summer wardrobe still? Given the weather that we've had in Manchester over the last couple of days, I think it's safe to say that summer is well and truly over. Bring on the crunchy leaves, vibrant colours in the trees and plenty of hot chocolate!